JK Simmons is always good casting. But there was no way in hell he was coming back to Spider-Man. Marvel and Sony would not have done that. I remember JK Simmons saying at one point that there had been contact (might have been before the Marvel/Sony deal) but I think it would have been possible. Not a guarantee, but I'd say over 50%. I've seen him respond to reporters/fanboys questions about it (that he wouldn't be against it), but I've never heard him or anyone else say that the actual studio had contacted him about it. EW just did two awesome interviews with Affleck and Cavill about their prospective roles, and it delves into the collateral damage controversy in Man of Steel, which seems to be the driving force of the beef between Bats and Supes. I like that they did not ignore it and it's an integral part of the plot, because there is a LOT of collateral damage in most superhero movies, whether it's DC or Marvel. Civil War hinted this issue too in the new trailer. “Superman’s weakness is that he doesn’t want to hurt anyone. He doesn’t want to scare anyone, and in that you can take advantage of him. This is someone who is a complete amateur, and he’s facing up against someone who is very well versed in the arts of War." After the destruction we saw in Man of Steel, is Superman suffering from a kind of survivor’s guilt, since he saved the world, but destroyed a city? I've been defending MOS in that Superman was not "Superman", just an alien being in a suit trying to figure out things, and this pretty much confirms what I thought the direction of the Character was going. Superman is the reason why these super beings are coming out and revealing themselves to the world because they can't do it alone. This will all lead into the assembly of the Justice League. God I just hope they fixed the story construction, which was a glaring flaw for Man of Steel. It sounds like the hiring of Chris Terrio to re-write the script helped fixed it. What do Batman and Superman talk about when you’re both in costume between takes? Like, “Do you need to pee?” “Yeah, I need to pee.” “Should we go now or wait?” “How much time do you think we’ll have between shots?” [Laughs] That’s pretty much it. The process. Exactly what I said as well about MOS. Dead on. So it has been CONFIRMED that the secret Jena Malone role for Batman v Superman is indeed Barbara Gordon. She has been cut from the theatrical release. More than likely, all that R-rated stuff might include her as she gets crippled from Jared Leto's Joker, who was reported to have shot something for BVS. Well, WB has been trying to make a Lobo movie for a while. Guy Ritchie was very vocal about directing it back in 2009 or 2010. It's interesting because he first appeared in Omega Men in the 80's, and then was revived in the 90's as this awesome biker bounty hunter. I don't think he's been popular since, with some brief appearances in the DC animated movies and Justice League tv show in the early 2000s. But if Guardians of the Galaxy proved anything, people will go see a movie about an interesting character they aren't familiar with, and one who is an anti-hero. I'm excited to see what happens with it. They have Jason Fuchs writing it, and reports are saying WB are very happy with the script he wrote for Wonder Woman. He was awesome in The Losers too. I don't know squat about Lobo, but if you think JDM is a good choice, then Clive Owen might be too - the two of them remind me a lot of one another. 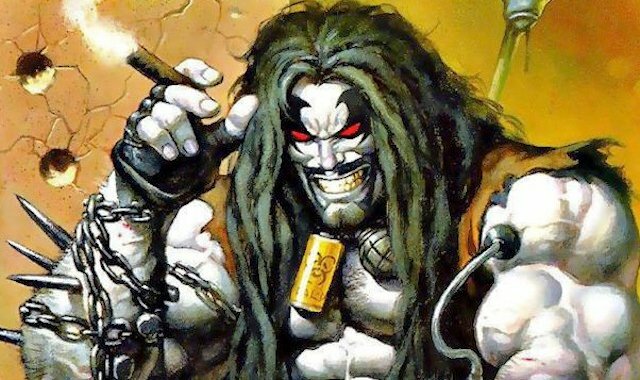 Red Letter Media suggested that an R - rated Lobo would be coming. As usual they are spot on. Reactions from the Batman v Superman Premiere last night have been overall pretty positive! And it sounds like Gal Gadot steals the show! Also some of the reactions say that the trailers have deceived us. Sounds good to me! Give me this damn movie now!!!! Glad this is getting good reviews. I may actually go see it now. I'm glad to hear all the good stuff coming out about BvS, but keep in mind that none of these reports are actual reviews from legit critics - those are still on embargo for a few more days. The two largest newspapers in Norway (VG and Dagbladet) have both reviewed BvS and given it 5/6. Dagbladet writes: "One of the most interesting super-hero movies since The Dark Night". I cant wait! Seeing it tomorrow! Dagbladet writes: "One of the super-hero movies since The Dark Night". I don't think I've ever seen someone rate something on a 6-point scale before. It's sitting at 35% on rottentomatoes. Apparently while the initial fan twitter reactions were good, the actual critics were less pleased. The general consensus seems to be "Fun, but a jumbled mess....also Gal Gadot is awesome"
I'm still hyped about seeing it tomorrow, I won't let other critics affect my opinion. The general consensus seems to be "Fun, but a jumbled mess....also Gal Gadot is awesome"
Yeah, that seems to be the gist of what I've seen from critics. While I admittedly haven't seen the film, on the face of it, that seems like HORRIBLE casting. I didn't hate the casting when it was announced, but every appearance by Lex in the trailers has been grating. I'm not seeing it until tomorrow, so just judging it on the trailers, but Eisenberg's Luthor looks like he would fit right into Batman Forever or Batman and Robin, and feels incredibly out of place in a darker than black batman v superman film. Speaking of how dark the tone is, I hear that this portrayal of Batman may be the darkest ever. Agree with all the above posts re: Eisenberg. Hope the movie proves us wrong. Honestly Eisenberg is the one and only reason I would consider seeing this film. He was the only part of the trailers that wasn't boring. Eisenberg will knock this out of the park. Adding some colorfulness to this serious superhero movie will add a bit of much need contrast.